Danyelle Draper left Nevada after graduating high school, but the 19-year-old college freshman values her deep roots in the Silver State. 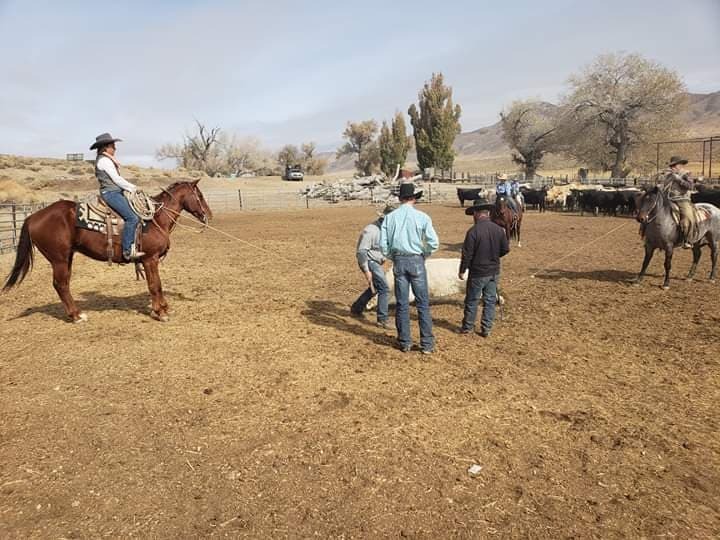 She grew up in a cowboy family on area ranches, learning to ride and rope as a kid. 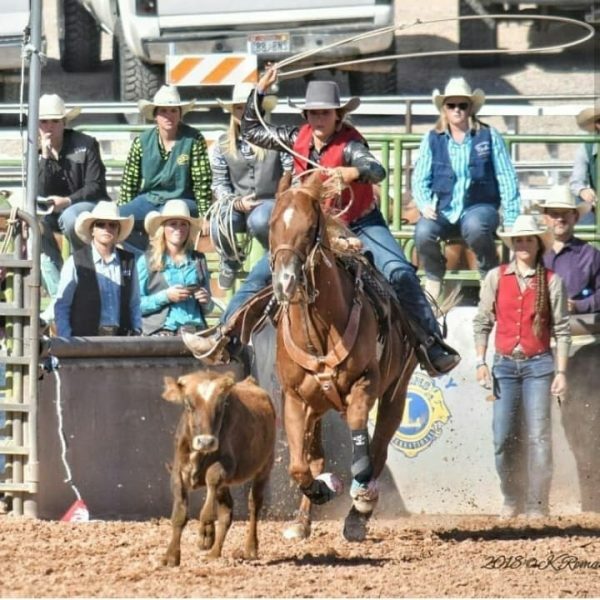 In her teen years, her skills earned her a rodeo scholarship to Colorado Northwestern Community College in Rangely. Today, Danyelle competes in barrel racing, team roping, breakaway roping, and goat tying. She is studying to earn a degree in Equine Management and Training. Here, CavvySavvy writer Jolyn Young visits with Danyelle about her childhood on the ranch, collegiate life, and picking up broncs. JY: Tell me a little bit about your background. DD: I had ponies and old broke ranch horses to ride when I was younger. I was definitely a momma’s girl when I was little. When I was about 10, I really started getting in to going to work with Dad and learning how to rope in the branding pen. Here, Danyelle and her sorrel horse hold the rope tight. JY: Did you attend public school? JY: Did you like school? DD: It didn’t bother me, but it definitely wasn’t my favorite thing to do. I knew that I had to finish to get to were I wanted to be, so that kept me getting my school work done. JY: What first interested you in your college major? DD: I love riding and starting horses! JY: Do you plan on making a career as a horse trainer? DD: I do, I would like to focus on reining and roping horses and some barrel horses. JY: How are you liking the college rodeo team? DD: My team is awesome. We all get along and just strive to better ourselves and horses. We aren’t a huge team, but we are like family to each other and it’s nice to have that. I made my first short round in goats last fall and am hitting right out of the top ten in breakaway, and goats at most of the rodeos. The rodeos are very exciting and fun to compete in. 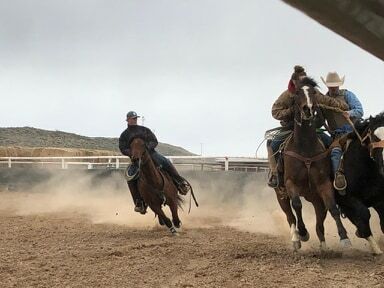 I am happy I have the opportunity to rodeo with the horses I have. Here, Danyelle competes in the breakaway roping event at a college rodeo. JY: Did you take horses from the ranch with you to college? DD: Yeah, I have 3 horses. 2 for rodeo and 1 for my colt class. JY: Tell me about the colt class. DD: In the first semester, you bring a colt that is started then your second semester you bring a colt that is only halter broke and start it yourself. I like it at a lot, but that’s also because I have been doing it for most of my life growing up and helping my dad. JY: Sounds fun! And you also pick up broncs. Tell me about that. DD: I helped my dad pick up broncs for a couple years in high school. My coach knew that, so I have been picking for them this year. I absolutely love it. It’s an adrenaline rush and just a lot of fun to do. JY: Have you had any difficulties due to being a woman with a smaller build, or has that not been an issue? DD: Sometimes, if the saddle I’m riding is a little bigger, then I have to hang on when I pick a guy up so they don’t take me with them when I set them down. I haven’t fallen off yet picking up, but I definitely don’t want to say I won’t because I have even seen men fall off when picking someone up. Danyelle helps a bronc rider safely dismount. JY: Who has been influential in helping you accomplish your goals? DD: My dad Tim Draper and mom Kelly Draper are the ones to give all the credit to. Without my mom, I wouldn’t be the young lady I am. Being a hand and roping and starting colts like I do is all because of my dad Tim. JY: Any advice for other young people looking to move off the ranch and attend college? DD: Don’t be scared to go out and take on college with a good view and pick a degree you know is good for you. Go adventure and have fun, but always remember where you come from. Mostly, just go have fun!